We’re frequently being asked to check out a stairlift that someone has bought ‘cheap’ and tried to install themselves, and there’s invariably something wrong. For your safety and peace of mind we include professional installation with every stairlift we offer. All reputable manufacturers and distributors do the same. If you’d like to read more about the subject, click the AEMA logo. The BBB’s records show how many complaints each manufacturer has received in the last 36 months. We recommend you check before buying a stairlift. Its tough to keep a perfect record, clearly some suppliers are trying much harder than others to satisfy their customers. Click on the BBB link below to see Florida Stairlifts Inc. record. You may be surprised to know that some "Accredited BBB major stairlift manufacturers businesses" do not advertise their BBB membership as their customer service and product quality record is so appalling. This should be a clear warning that doing business with that type of company could be risky. To ensure you get to choose the stairlift customized to your needs and not just pushed to the take the one that’s offered. Talk with experts that are not tied to a single make of stairlift. Independent stairlift dealers can provide options to customize your lift to suit your specific needs and budget. Florida Stairlifts, Inc. could be your one stop, quality stairlift shop. Alternatively "Google" the search term "stairlift complaints" it will become apparent who not to use to supplier your stairlift equipment and installation services. Stairlifts are life enhancing devices allowing people to regain their independence. Stairs present a major risk for home injury through falling, over exertion or are just a barrier to accessing upstairs bed and bathrooms. Choosing a stairlift is often a once in a lifetime decision. Do your product and stairlift company research carefully. Once you have chosen your lift it needs to be purchased for a fair price and professionally installed to guarantee safety and reliability. For curving rail stairlifts insist on reviewing your staircase drawing detailing the rail path with dimensions. This will ensure you get a true custom stairlift that follows your staircase and leaves enough room for people to walk by safely. Modular or "kit" lifts may install quickly but you will have to live with the normally less than acceptable intrusion into the stairway. 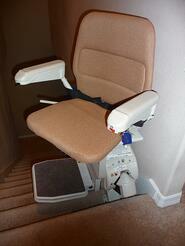 Ask for company references and check if it is possible for you to see and ride a prior customers electric stairlift. Get help from an independent stairlift expert that can guide you “For Free and without obligation” to the best stairlift solution for you and your family. The correct stairlift selection will give you years of safe, smooth and reliable operation at a price you can afford.